My Front Page lets you create your own online newspaper! Now you can instantly post news stories to your own personal page, making it easy to share and discuss information that matters. In addition to news stories, you can post your own content including notes, announcements, and more. Be your own publisher! Post articles that interest you and add your own thoughts on the topic. Then share your own personal My Front Page URL on social media to spark conversations. See an example. Post articles for your students to read, along with homework assignments, contextualizing information, announcements, and whatever else you would like. See an example. Create your own newspaper! Learn about different viewpoints by reading, posting, and commenting on articles from different perspectives. Share interesting articles with your friends. See an example. 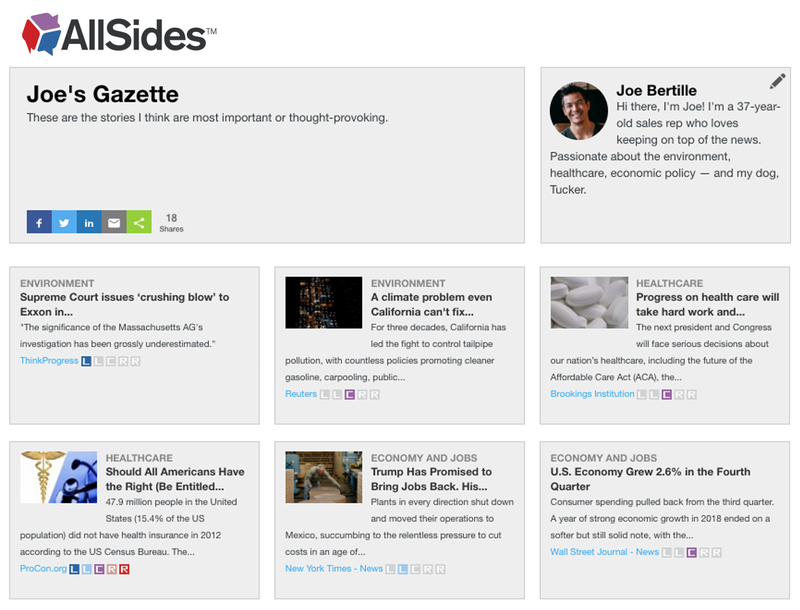 To add an article from AllSides, hover over any news article at AllSides.com and select + My Front Page. To remove an article, hover over any article on this page and select – My Front Page. To add a card with your own custom content, click the + Add Card button on this page. To edit or remove a card, click on the pencil icon in the upper-right corner. Click and drag cards and articles to organize your My Front Page however you like. My Front Page is a new feature, and we want to make it bigger and better! Please let us know what you think, along with any suggestions you might have, by emailing us at feedback@allsides.com.